One of the great joys of being a tennis spectator is the Grand Slams. Each slam has a unique personality and every year they are many great individual stories. It is like having four Super Bowls every year. The 2018 Men’s Australian Open was no exception. On the men’s side, the top story was Roger Federer’s five-set victory over Marin Cilic in the finals 6-2, 6-7(5), 6-3, 3-6, 6-1. This was Federer’s 20th Grand Slam singles victory. Federer won his first Grand Slam at Wimbledon in 2003. That was eons ago! In 2003, George Bush had been president for two years, Saddam Hussien was captured, Lance Armstrong won his fifth Tour de France. Camera phones were introduced in 2003 and cargo pants were the rage. At the time, expectations for Federer were low because he was an up-and-coming player. Six months later, he won his first Australian Open. Fourteen years later, Federer is still dominating. His victory over Cilic was his sixth Australian Open championship. The 2018 Men’s Australian Open saw another lackluster performance by the American men. The top American performances were by unseeded players Ryan Harrison, who went 2-1, and Tennys Sandgren who was 4-1. Harrison lost to #6 seed Marin Cilic. Sandgren lost in the quarters to Chung, an unseeded player from Korea. Unfortunately, Sandgren’s playing accomplishments were overshadowed by comments he had previously made on social media. The 3 seeded Americans had a tough tournament. Sam Querrey, #13, won a round while Jack Sock, #8, and John Isner, #16, were one and done. The seven first round losers included John Isner, Kevin King, Jack Sock, Steve Johnson, Donald Young, Jared Donaldson, and Frances Tiafoe. In fairness to the men, King was defeated by #15 seed Tsonga; Johnson was ousted by fellow American, Kudla; Young fell to #14 seed Djokovic, Donaldson lost to #21 seed Ramos-Vinolas and Tiafoe fell to #12 seed Del Petro. The four second round losers, who were 1-1, also faced tough draws. They included MacKenzie McDonald, Denis Kudla, Tim Smyczek, and Sam Querrey. Kudla lost to #5 seed Theim and Donaldson lost to #21 seed Ramos-Vinolas. In total, the 13 American men won 10 matches while losing 13. Harrison and Sandgren won 6 of the 10 matches. Overall, the performance by the American men was about the same as 2017, when 14 men were 10-14. Hoping for a stronger performance from the younger players in the French Open starting May 27th. Both the American boys and girls had stronger than usual showings at the 2018 Australian Open. Hopefully this is a sign of good things to come at upcoming Grand Slams in 2018. For the American boys, #7 seed Sebastian Korda, son of former Czech tennis star Petr Korda, won the championship. He defeated the #2 and #6 seeds (Miladinovic and Tseng) on his way to the title, and ended the tournament 6-0. Both Andrew Fenty and Sangeet Sridhar dropped their first round matches. Fenty was the #13 seed. Jaycer Lyeons and Tristan Boyer were 1-1, Lyeons lost to an unseeded player and Boyer was ousted by the #2 seed, Miladinovic. Drew Baird had a solid tournament, reaching the round of 16 and finishing 2-1. In 2017, only 4 American boys participated and they finished with a disappoint total of 3 wins and 4 losses. The 2018 Australian Open results were much stronger. The 6 American boys finished 10-5 this year. The American girls also had a strong showing. In 2017, the 7 American girls won 4 matches and lost 7. In 2018, the 8 American girls were 9-8. FUN FACT: The combined total of wins for the 7 American girls was the same as the combined total for the 18 American women who competed in the main draw. Three of the girls lost in the first round: Con Gauff, Niluka Madurawe, and Hurricane Tyra Black. Gauff and Black lost to unseeded players and Madurawe was ousted by the #13 seed Vismane. Peyton Stearns and Nicole Mossmer were 1-1, as they bowed out in the round of 32 to seeded players. Stearns fell to #1 seed Wang and Mossmer lost to #10 seed Sun. Elysia Bolton and Alexa Noel posted 2 wins and 1 loss. Bolton was the #12 seed. She was defeated in the round of 16 by finalist Burel. Noel was the #7 seed. She lost to #9 seed Wang in the round of 16. Finally, Dalayna Hewitt finished the tournament 3-1. She had an upset victory over #4 seed Carle in the first round, followed by wins over two unseeded players. Hewitt lost to finalist Burel in the quarterfinals. Typically, very few Americans play the Australian Junior Open and their performance is usually lackluster. The results were different in 2018. Based on what happened in Melbourne, look for a strong showing at the French Open and Wimbledon junior tournaments in a couple of months. Retro tennis is still the rage in 2017, thanks to Rafael Nadal. By all standards his performance at the 2017 Men’s French Open was a “10”. • The Bible views “10” as a complete and perfect number. Nadal’s 10th championship at Roland Garros was “complete and perfect.” With this victory, he is 10-0 when he reaches the finals. The Spanish newspapers called his victory, “La Decima”. • The highest score in Olympic competition is a “10”. If the Men’s French Open was an Olympic event, Nadal would have been given a “10”. He did not lose a set and only lost 35 games in 7 matches. He lost 6 games in the final against Stan Wawrinka, a match that lasted 2 hours and 5 minutes. • In the movie “10”, George Webber (played by Dudley Moore) fantasized about meeting the perfect woman, Jenny Miles (played by Bo Derek). When Webber finally met her, he quickly learned she was a phony. Her looks did not tell the full story; she was not a “10”. Even Webber could quickly recognize that Nadal was a “10” for his record at the French Open. Nadal has 79 wins and only 2 losses. Prior to his 2017 victory, Nadal captured his first 9 championships between 2005 and 2014. This level of dominance is unprecedented in sports such as basketball, baseball, and football. • The Boston Celtics; they were 17-4 in the finals. • The Minneapolis/Los Angeles Lakers; they had the most appearances, but they were 16-15 in the finals. • The Chicago Bulls; they were 6-0 in the finals during the Michael Jordan/Scottie Pippen era. • The New York Yankees were 27-13. • The St. Louis Cardinals were 11-8. • The Oakland Athletics were 9-5. • The San Francisco Giants were 8-12. • The Boston Red Sox were 8-4. • The New England Patriots were 5-4. • The Pittsburgh Steelers were 6-2. • The Dallas Cowboys were 5-3. • The Denver Broncos were 3-5. • The San Francisco 49ers were 5-1. No matter how you look at it, Rafael Nadal is a”10″ for his record at the French Open. Even better, Nadal kept retro tennis alive! Hopefully the stars of the past will continue to dominate at Wimbledon next month. The nine American girls who played in the 2017 French Open Juniors won 20 matches and lost 8, with two Americans meeting in the finals. Johnson’s loss was disappointing because she was seeded number10. Elisia Bolton, 1-1, was the only loser in the second round. She was defeated handily by number 1 seed Anastasia Potopova. Caty McNally and Amanda Anisimova both finished with 3 wins before bowing out in the quarterfinals. McNally lost to Whitney Osuigwe 6-3, 6-3 and McNally fell to Rybakina 7-6, 6-4. Claire Lui, 5-1, lost to Osuigwe 6-4, 6-7, 6-3 in the All-American finals. None of these athletes lost to seeded players. The following boys were 1-1 and dropped their second round matches. Only Thomas lost to a seeded player, #5, Yu Hsu. In the third round, Sebastian Korda lost to fellow American Gianni Ross 2-6, 6-4, 6-0. Oliver Crawford was defeated by Clement Tabur 6-4, 4-6, 6-4. Ross was ousted in the quarterfinals by number 3 seed Alexei Popyrin 4-6, 6-1, 7-5. Popyrin went on to win the championships. Time will tell if the good fortunes of the juniors at the French Open is a sign of good things to come in the years ahead. Twenty-year old Jelena Ostapenko was the story at the 2017 Women’s French Open. Along her path to the title, the 47th-ranked and unseeded Ostapenko beat Louisa Chirico, Monica Puig, Lesia Tsurenko, Sam Stosur, Caroline Wozniacki, Timea Bacsinszky, and SImona Halep. The road to victory was not easy for Ostapenko. She won five of her seven matches in three sets. Unfortunately, there were no Cinderella stories for the 16 American women. As a group they finished 13-16. With the exception of Venus Williams, they demonstrated their strength was not playing on the red clay at Roland Garros. Chirico lost to Ostapenko, McHale lost to 8th seed Kuznetsova, Brady lost to 13th seed Kristina Mladenovic. Admittedly, these women had tougher than normal first round matches. On the other hand, Coco Vandeweghe (seeded 19th) and Lauren Davis (seeded 25th) did not hold their seeds. It is noteworthy that Amanda Anisimova played in both the girls’ junior singles and the championships. Unfortunately, Keys did not hold her 12th seed. Bellis, an 18-year old, is the youngest of the group. She has shown promise since defeating 12th seed Dominika Cibulkova at the 2014 U.S. Open. Bellis has improved since that match and is on track to be a force in the top ten. Venus Williams, seeded 10th, was the only American woman to hold her seed with a 3-set loss to Timea Bacsinszky in the round of 16. The next Grand Slam stop is WImbledon. Will Venus Williams continue to play well and be the American woman with the most wins? Will Madison Keys finally have a break through tournament? WIll one of the younger players such as Jennifer Brady, Shelby Rogers, or Coco Vandeweghe have a break through event? Check back in a couple of weeks. The talent in the junior division at the Grand Slams has become more diverse over the years. As a result, both the American boys and girls faced stiff competition in the Australian Open Juniors competition, but both managed to have players reach the round of 16. Nicole Mossmer, J. Rodriquez-Benito, Caty McNally, Hurricane Tyra Black, and Natasha Subhash lost their first round matches. Both Carson Branstine and Taylor Johnson posted 2 wins and 1 loss as they bowed out in the round of 16. To illustrate the diversity of the draw, the 8 quarterfinalists represented 8 countries: Canada, Great Britain, India, Japan, Russia, Switzerland, Taiwan, and Ukraine. Overall, the 7 American girls won 4 matches and lost 7. In the boys draw Olukayode Ayeni and Trent Bryde lost in the first round. Tristian Boyer won his first match before losing in the second round. Alexandre Rotsaert won two matches before losing in the round of 16. Overall, the 4 American boys won 3 matches and lost 4. As was the case in the girls draw, there was also significant geographic diversity on the boys side. The 8 quarterfinalists represented the following 7 countries: China, Cyprus, (2) France, Hungary, Finland, Israel, and Russia. It is easy to be critical of the USTA Player Development Program for the fact that none of the American juniors advanced past the round of 16. Typically very few American juniors play the Australian Junior Open and their performance is often lackluster. In addition, it is easy to see that a number of countries other than the United States are developing world-class players. With stronger and greater geographic diversification, it is even more challenging to for the USTA to develop the top junior players in the world. Look for better things at the French Open and Wimbledon. There were many great individual success stories at the 2017 Australian Open. The comeback of Venus Williams to reach the finals against her sister was a dream come true for tennis fans. The return to glory for Federer and Nadal was even more spectacular because neither was expected to reach the finals. As a relatively unknown, Roger Federer won his first Grand Slam at Wimbledon in 2003. Six months later, he won his first Australian Open. Federer’s 2017 victory over Nadal was his fifth Australian Open championship. Federer’s first Grand Slam seems like it was light years ago. George Bush was midway through his first term as U.S. President and Chicago won an Oscar for best movie of the year. Since Federer’s victory at Wimbledon in 2003, there have been 55 Grand Slams, including the 2017 Australian Open. 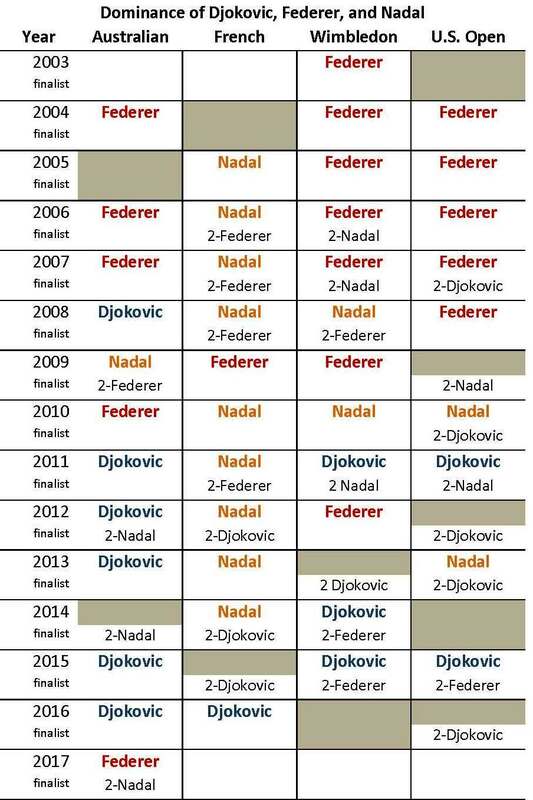 Roger Federer has won 18, Nadal has won 14, and Djokovic has won 12. That is 44 Grand Slams. Other players have won only 11 events. Stan Wawrinka and Andy Murray have both won 3 Slams each and there were five “one-hit” wonders. In other words, only 10 different men have hoisted a Grand Slam trophy since Wimbledon 2003. Of those 11 Slams that the big three did not win, one member of the trio was in the finals of six events. 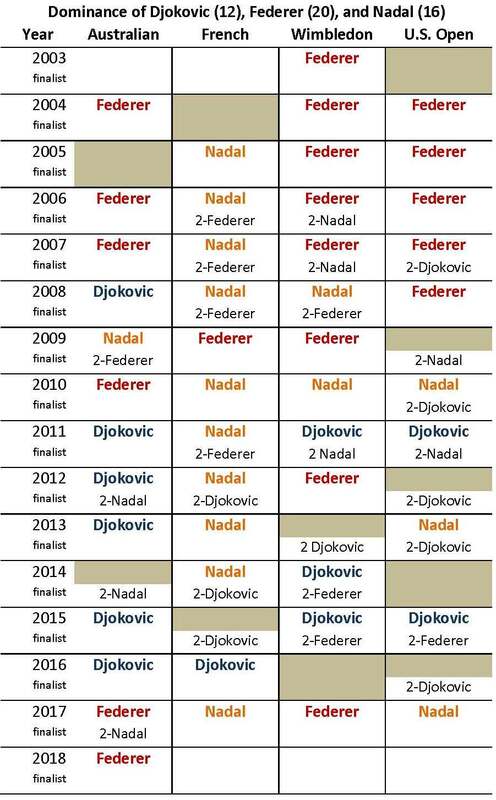 Since Wimbledon 2003, there have been only 5 Grand Slam finals that did not include Federer, Nadal, or Djokovic. If this was baseball, fans would be hollering, “Break up the Yankees”. At no point during this period of 55 Grand Slams has an American captured a championship. Andy Roddick was the last American to appear in a slam finals (2006 U.S. Open). Andre Agassi retired at that event, leaving Roddick as the top American male player. The combination of Agassi’s retirement and the depth of great European players has made it rough sledding for the American men. That was evident at the 2017 Australian Open. Fourteen American men were entered at Melbourne. Eight of them started out strong. First round losers included 6 players: Michael Mmoh, Jared Donaldson, Taylor Fritz, Reilly Opelka, Bjorn Fratangelo, and Donald Young. With the exception of Donald Young, the other five are part of the youngsters who are making the transition from solid junior careers to the professional circuit. There is reason to be optimistic they will become strong contenders in the next 2 to 3 years. Things took a turn for the worse in the second round when John Isner, Ryan Harrison, Noah Rubin, Steve Johnson, Frances Tiafoe, and Ernesto Escobedo were ousted. The remaining two American men, Sam Querrey and Jack, Sock lost in the third round. Overall, the American men won 10 matches while losing 14. Hopefully better times are in store for the young American men. 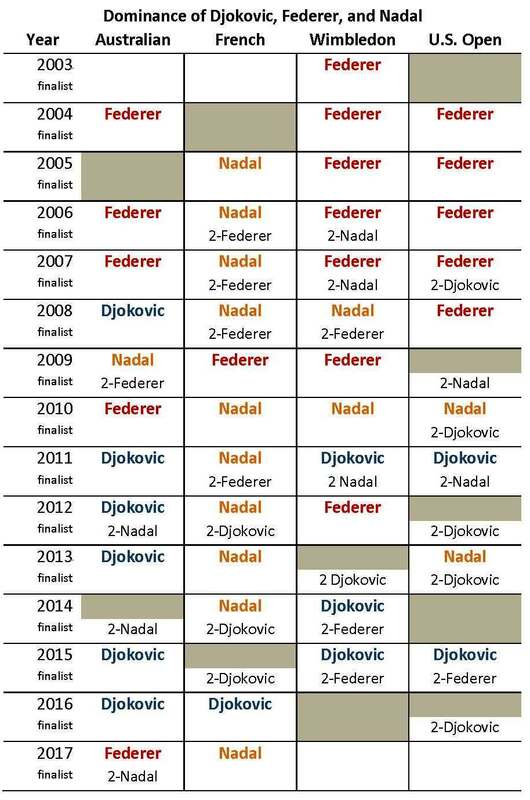 As for Federer and Nadal… wouldn’t it be great if they reached the finals of several other Grand Slams this year? A group of American women had noteworthy accomplishments at the 2017 Australian Open. For a few days they made American tennis great again. CoCo Vandeweghe showed that she is a rising star for the Americans. The question is whether she will become a consistent top 10 contender or flame out like others before her. Nicole Gibbs and Jennifer Brady demonstrated that it is possible to go the route seldom taken. They played college tennis before joining the professional circuit full-time. Most players avoid college and work with the USTA Player Development Program instead. Gibbs played three years at Stanford and was an All-American and two-time NCAA single champion. Brady was an All-American in her two years at UCLA. Mirjana Lučić-Baroni, a 34-year old Croatian, surprised many by reaching the semifinals before being ousted by Venus Williams. Lučić-Baroni was a top junior in the late 1990s before dropping off the screen. Her comeback now includes a spot in the top 50 in the world. It remains to be seen if she has the staying power to maintain her current ranking. These were great accomplishments; however, they were overshadowed by the success of the Williams sisters. Their journey to the finals t will likely be their last Grand Slam singles finals against each other as Serena captured her 23rd Grand Slam singles final with a 6-4, 6-4 victory over the 36-year old Venus. Led by the Williams sisters, the American women were a dominant force Down Under. Of the 18 Americans, only 7 were defeated in the first round: Louisa Chirico, Madison Brengle, Christina McHale, Lauren Davis, Vania King, Anna Tatishvili, and Kayla Day. This group of young women have experienced success as junior players, but struggled in their transition to the professional game. Five women won their first round match before being bumped in the second round: Samantha Crawford, Shelby Rogers, Varvara Lepchenko, Julia Boserup, and Irina Falconi. Alison Riske and Nicole Gibbs posted two wins before exiting in the round of 32. Jennifer Brady exited in the round of 16 with three wins, while Vandeweghe was 5-1 before losing in the semis. Coco”s victories included a convincing upset of Angelique Kerber in the quarterfinals. Overall, the American women won 30 matches and lost 17. Combined, the Williams sisters won 13 of the 30 matches won by American women. Congratulations to Serena for adding her 23rd Grand Slam and to Venus for showing the world that a 36-year-old woman can play tennis with the best of the young whippersnappers. For a few days in Melbourne, these ladies helped make American tennis great again. Great sports programs find creative ways to distinguish themselves for the way they teach techniques, tactics, and values such as respect, discipline, patience, and perseverance. More importantly, great programs teach their athletes “why” these skills, strategies and values are important. This is in line with one of the USA Volleyball’s axioms for coaching – The teams whose coaches teach their athletes “why” will beat the teams whose coaches teach their athletes “how”. 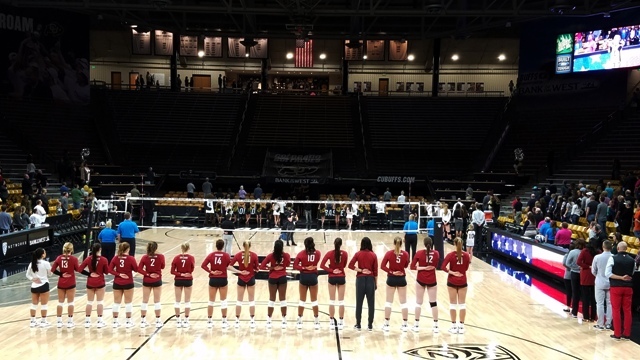 That point is illustrated in the following picture taken during the national anthem at the volleyball match between Washington State University and the University of Colorado during the 2016 PAC-12 season. For years, the Lady Buffs and every visiting team have stood at attention during the national anthem. The Washington State University Cougars take it a step further. As a team, they show respect for the flag and what it should mean to all Americans. In addition, they did this long before San Francisco 49er quarterback Colin Kaepernick made a decision to refuse to stand for the playing of the national anthem during the 2910 NFL preseason. Hats off to the Cougars (and the flag)! Coaches Jen and Burdette Greeny have taught their athletes “why” it is important to show respect for the flag. In the process of teaching their athletes “why”, they have reinforced the importance of understanding the value of showing respect for themselves, their teammates, coaches, officials, opponents, and others. Hats off to the Greenys and the coaches in all sports who teach important values such as respect and discipline to their athletes.